I don’t know. It seemed like a good idea at the time. I hadn’t seen her for a couple of years, at least. Frankly, I had lost count of the number of months that had gone by since I’d last spoken face-to-face with my daughter. Other than on Skype of course. Skype is the poor man’s gatherer of lost company. Skype is a little better than a phone, which is a little better than a string and two cans. Skype’s limitations become so apparent once your loved one is there, finally, standing in front of you, the way she was, when she came through the luggage exit area at the airport. On Skype, you can’t walk to her, and grab in her a big hug. Once we got to the park, we were going to rent a canoe (NOT MY IDEA. HERS. 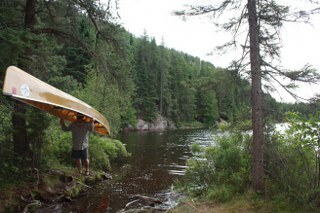 ), and then paddle up to a remote lake. “Remote” in this case, equalled nine hours of canoeing and portaging. For those who, like me, aren’t irritatingly healthy fresh-faced outdoors adventurers, “portaging” happens when you get to the end of one lake – or other body of water – and you need to then travel over land to the next body of water. At that point, you need to “portage”: you gather your things, and then try to find a way to transport them and your canoe to the next canoeing take-off point. If you’re a seasoned expert, you will have purchased lightweight everything, so that you could do the portage in one trip. While my daughter had done it before, I haven’t, and so we ended up taking a couple of trips back and forth each time across land. First with the canoe, and then with the rest of the stuff. And oh man, there was a lot of stuff. Portaging can go quite quickly, or last for a long time, depending upon distance. In one instance, the distance was about a half a kilometre, and since we had to make a couple of trips at least, it ended up being about two kilometres or more, over hilly ground, and over a path composed of dirt and sabotaging rocks. When we first set out in the canoe, I thought to myself, ‘well for good or ill, you’re committed. Just don’t tip the canoe over and you’ll be fine.” Canoe-tipping is easily done, which is why it’s so important to center yourself on the seat of the canoe before starting off. Sometimes I got it right. Sometimes, she said “uh, Dad. Can you shift to your right, just a bit?” I’d shift, and the whole canoe would register its surprise, mostly by wobbling. This of course served to enhance my heart health, being as it started to beat rapidly in panicked angst. And so we set off, under a partly cloudy sky. Her in the back, steering the canoe, and me in the front, point man to this great adventure. About ten minutes after paddling, we noticed a motor boat puttering into the bay. Angie immediately steered us into waves of the wake the motor created, so as to prevent canoe tippage. I said nothing, but my eyes ached from staring so widely at it all. I watched the major waves assaulting our flimsy little canoe, trying desperately to fling us into the drink. “Oh about 4”, I lied. She laughed, and we paddled on. I nodded, but could only think of the top part of my back, which was now bitterly complaining at me. My muscles were calling me names. Bad names. 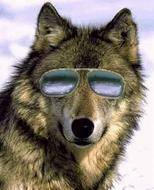 The inner wolf tried to cover its ears in embarrassment. Definitely not the best idea in the world. And this was only after a half hour of paddling. Little did I know this was actually the best part of the day. Sometimes, ignorance of pending danger is a blessing. The sun played hide and seek with the clouds, and each moment became either a blessing or curse, depending upon its intense rays or the blessed relief of momentary shade. And still we paddled. At the end of one portage area, we took a bit of a break, and then we set about packing the canoe again for our next paddling session through a small sort of river area. I walked to the canoe with one of the massive backpacks, and suddenly noticed that, while one foot was eager to continue, the other had stopped dead. Unfortunately, it was the leading leg that stopped, so when the follow-up leg moved forward, all of us tumbled into the water: me, my legs, the huge backpack and all. I quickly stood up, and this time the stopped leg came unstuck and it was the trailing leg that decided to remain where it was. I violently pulled it up, demanding to know what the hold up was, and it reluctantly freed itself with a loud and embarrassing “plop!”. In its defiant insolence, it left something behind though. My flip-flop shoe. The mud had taken it. Sucked down to a corner of marsh hell, where all wayward flipflops worn by neophyte would-be canoe adventurists go. My daughter and I did our best to find it, moving our hands through the mud. Then waiting for the silt to settle so we could try and see it through the water. We couldn’t. We tried prying it up by using the paddle, but all we pulled up were stones and hard clay. After about forty-five minutes we gave up. In my heart I knew I’d never see it ever again. The sadness was acute. Though not nearly as acute as the pain. And anyway, I had a pair of running shoes. So we got back into the canoe, and, with back muscles now weeping in agony and despair, paddled away. Defeat, right from the jaws of victory. The pain in my back raised its clenched fist high. “YES” it barked. And so we paddled. And we portaged. And the sun’s slow saunter across the sky began to pick up speed. Which I noticed. I didn’t think she noticed. The sun pretty much raced to the horizon. I had visions of being stranded in the lake, with no place to go. The ranger told us there would be some empty camp sites on this particular lake, but each one we thought might be vacant, turned out to have campers. Every campsite was marked with a bright red piece of tape. Soon, I knew, we wouldn’t even be able to see those. In our panic, we stroked madly from campsite to remote campsite, asking the inhabitants if they’d seen any open ones. They hadn’t. We kept going. For the longest time, all we saw were trees, and places where no canoe could ever go. My back was now screaming, but I couldn’t stop. Could not slow down. We had to find a campsite. Had to. “What if we just landed over here?” I asked her, pointing to what looked like a small island. Fear battled ferociously with pain. Fear won. We paddled like mad. One of the older guys said “no. I don’t think there are any. We came from the opposite direction as you and we couldn’t find anything. In fact, this site we’re on right now is not legal. See the sign? ” He pointed to a tree, which had a “no camping” symbol on it. I sighed. Angie wanted to say “it’s OK” but she couldn’t get the words out. I think the relief in her strangled her need to be polite. He said “no problem!” and with that, he and his friend’s sons helped us pull in and get set up. These turned out to be some pretty great guys, full of laughter, who loved to talk and joke. The two men hadn’t been canoeing for about fifteen years (I think) and so were experiencing a lot of pain. Probably not as much as I was. I like to think that my back pain set the standard for all muscle pain, and that it’s not possible for pain to get any worse than that. Nine hours. Nine hours we had been out there, paddling and portaging. And still we weren’t done. There was still some setup to do before we could relax. But at least, for that night, we knew we were safe, rescued by the kindness of strangers. We had a place to sleep, in our little tent and sleeping bags. We had very good company. We had a fire. And if we wanted, we could get some food going. I wasn’t hungry though. Couldn’t eat if I tried. After meeting all of them, and sharing our experience, my exhaustion took over and I escaped to the tent. Angie played the gracious grateful guest, and continued talking with them until the wee hours of the morning. There’s more to tell, but maybe we’ll leave that for another blog. Oh, one more thing before I close off. I learned a very important camping lesson, there in the woods overlooking the lake. It is vitally important to first check the wind direction before attempting to pee. Great adventurous girl you got there. I bet she thinks she has a great dad too. Can’t wait for the rest….please..
Coming soon. Thanks for stopping by, Ileene! I agree with you Speaketh, I can’t wait to hear the rest. hahah I was just stressing out to the max just reading your story! It sounds like an awesome adventure if you could get the beast under control…. I’m posting part 2 tonight. What an awesome trip! I don’t care if you were in pain and peed on yourself. It really sounds like fun! You know Abe, once the trip was over and we were sitting in a restaurant, enjoying a nice meal, while still dirty and bedraggled, it *was* fun to talk about. We laughed ourselves silly. During the time? Kind of a different story. Canoe trips are not for the faint of heart. I love heading out for a week or two, the first day is always the wost… there are muscles you only use when paddling. I look forward to the remainder of your trip, I hope you had a chance to relax and enjoy.